Nausea in pregnancy is common and not usually something to be concerned about. There are many things you can do to feel better and get through the day.When you wake up, take your time getting up out of bed. Sudden movement, sometimes any movement can aggravate nausea. Move slowly and ask for help from family. Something as simple as having someone else make you a bowl of cereal will allow you to sit still and minimize nausea. Throughout the day try to eat small portions frequently and do not skip meals. Make healthy choices when selecting your meals – its important when you are pregnant but also because you may have an increased sensitivity to spicy or fatty foods that may make contribute to nausea. Drink plenty of water. Ginger teas, peppermint and chamomile teas may help ease nausea as well as fresh air and exercise. Try going for a little walk every day. Although most pregnancy nausea is more of a nuisance than a problem, if you are vomiting daily and not able to keep your food down, please see your doctor. You may need to be treated for nausea. Dehydration can be serious and your baby needs the nutrients that you aren’t keeping down. Sweetsation Therapy Lip Balm – The only organic lip balm I’ve seen specifically for nausea caused by morning sickness or labor. A blend of Litsea and Peppermint oils help combat nausea by delivering it’s aromatherapy benefits right under your nose. Dry lips and mouth are a common complaint from moms in labor and this balm will moisturize lips and provide very safe and soothing way to ease nausea. Perfect! 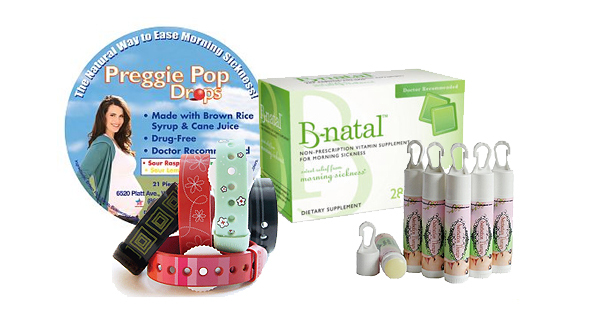 Psi Bands – Psi Bands (pronounced “Sigh Bands”) are stylish, FDA-cleared acupressure wrist bands for the relief of nausea due to morning sickness (pregnancy). Unlike any product on the market, Psi Bands are: Adjustable, Comfortable, Drug-Free, Fashionable, Waterproof, Reusable and Affordable. Happy Mama Spray by Earth Mama Angel Baby is virtual bliss in a bottle! A gloriously uplifting aromatherapy spray, it’s made only with pure essential oils and flower essences for on-edge new mamas as well as more seasoned, patience-tested ones. For pregnancy nausea, spritz a little onto your wrist and inhale to help settle the queasies. Happy Mama Spray is made with a safe, proprietary blend that includes lime and ginger pure essential oils. Morning Wellness Tea by Earth Mama Angel Baby. When every little smell is suddenly a challenge and those morning queasies often last all day long, USDA Certified 100% Organic & Certified Kosher, ginger-minty Morning Wellness Tea is a comforting way to help get you through the day! Blended with stomach settling ginger root and spearmint, a safe hint of peppermint, and soothing chamomile and lemon balm with just a yummy twist of orange peel for flavor. B-Natal™ Pops or Lozenges gives women just the right amount of vitamin B6 to help soothe the symptoms of morning sickness. Since vitamin B6 is recommended by ACOG as a first line of treatment for morning sickness, women can be confident that B-natal is the right choice for mothers and their baby.